This blog is not about Angkor Wat, Ta Prohm or Bayon. Everyone knows these are the big ones, so instead I’m going to pay some attention to the lesser-visited but just as worthy temples you can explore while staying at Siem Reap. 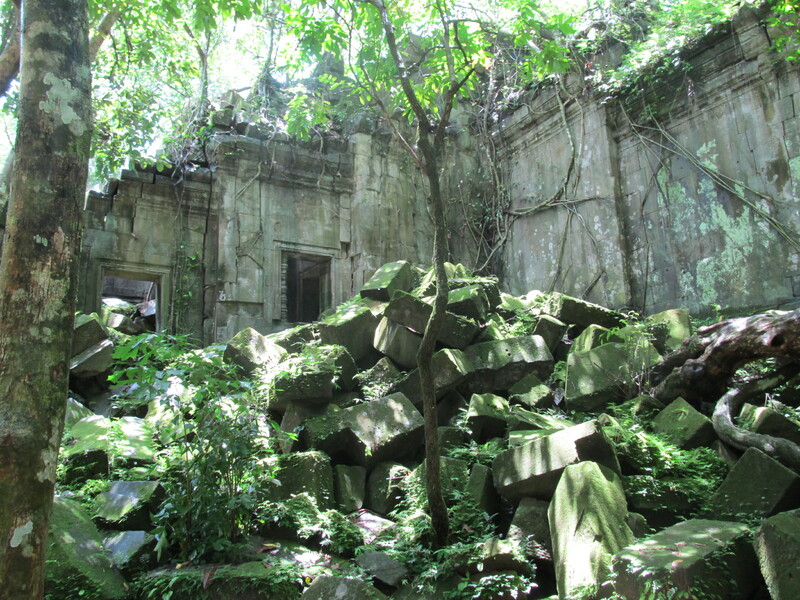 About 70km northeast of the city is Beng Mealea. This temple has been left at the mercy of the jungle, and boy, has the jungle been having some fun. 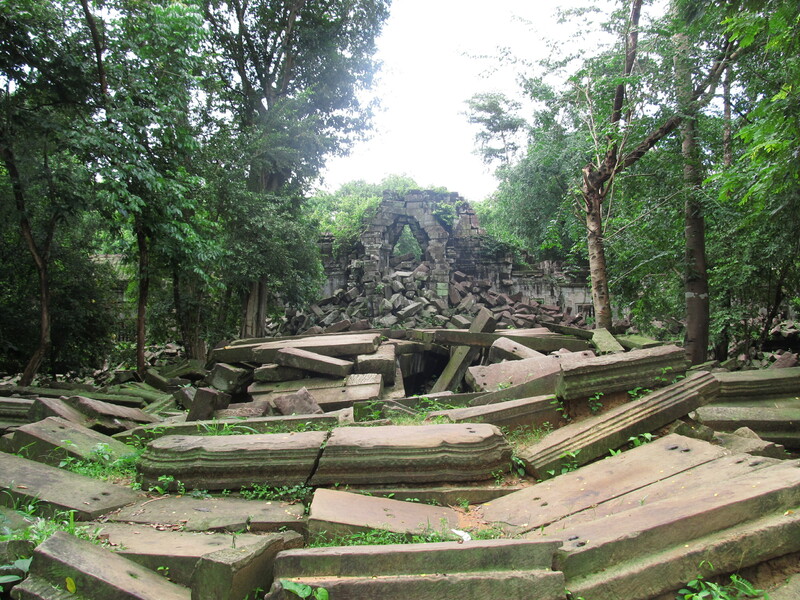 Nearly all of Beng Mealea has fallen down and the floor inside the main walls is a haphazard mess of moss-covered bricks. And when I say brick, I actually mean huge slab of stone which weighs over one tonne. It was built by King Suryavarman II in the 12th century – the same guy who went on to create the spectacular Angkor Wat. The two temples would not have been dissimilar back in the day. 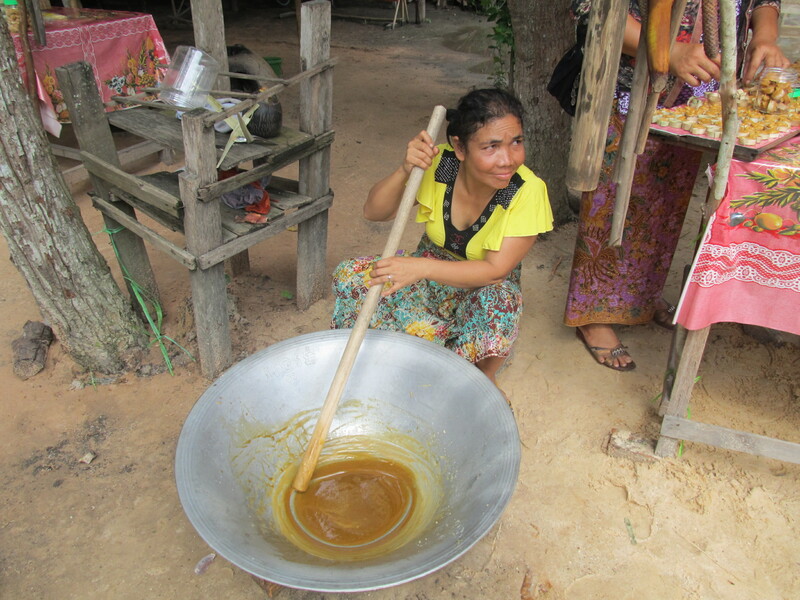 We arrived by car, stopping en route to sample traditional Cambodian cake cooked in a bamboo stem at the roadside. We crossed the threshold of Beng Mealea via some wooden stairs to the right of the main entrance, and immediately stopped, unsure where we were supposed to go next. Luckily, an Apsara caretaker (aka young Cambodian girl in flip flops) began to lead us through and over the rubble, which we would never have been brave enough to face alone. Every time we turned a corner in the temple we thought “oh, can’t go this way, it’s blocked by rubble”. Our caretaker would then nimbly hop up and over the top of said rubble while we worriedly followed, taking extreme care. It did occur to me more than once that if either myself or my fellow adventurer Kim were to fall and break a leg out here in the middle of the Cambodian jungle, we would be more than a little screwed. By the way, while exploring this stunning place we encountered a total of four other tourists. Eventually, after daring each other to climb and sit in branches swinging 20 metres in the air and having to leap over several sheer drops on the way, we reached a wooden platform that was built as part of a film set a few years ago. 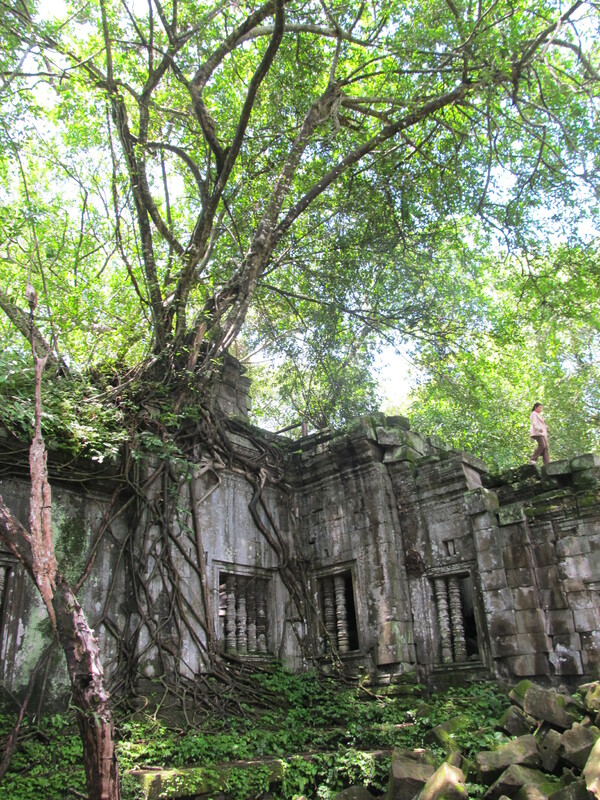 From up there you get a great view of the ruins of Beng Mealea – as the Cambodians say, this temple is “broken down”. Ta Prohm may be the temple with the Tomb Raider tree, but if you really want to know what’s it like to be Lara Croft this is a must-visit place. Oh, and we didn’t break any legs, luckily. The following day our beloved tuk tuk driver Den took us to Angkor, but suggested we visit a temple slightly further away called Banteay Srei. Otherwise known as the ‘lady temple’, this red-hued construction is covered in amazingly intricate carvings which are said to be too delicate to have been created by the hand of a man. I’m inclined to agree there. 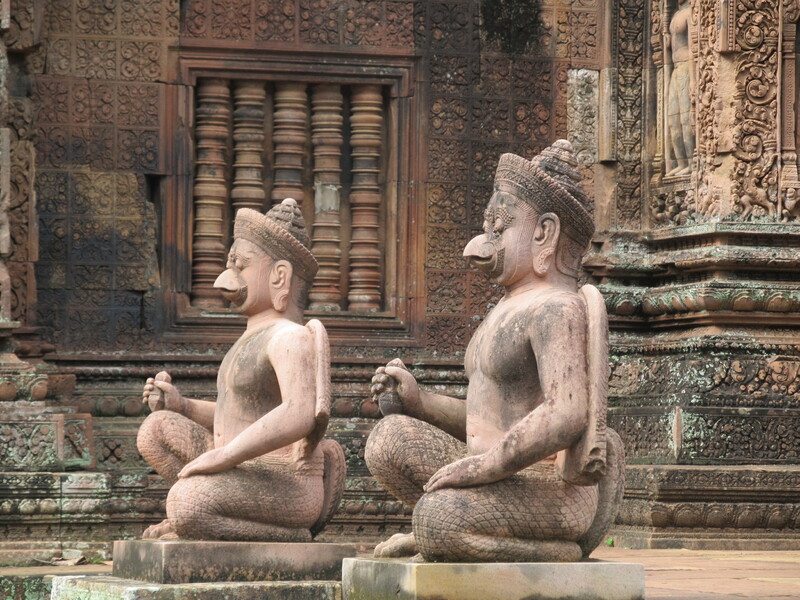 Kim and I were in agreement that the journey to Banteay Srei was as worthy an experience as the temple itself. By tuk tuk it takes an hour, and you are treated to hundreds of quintessential rural Cambodian scenes such as farmers with skinny cows pulling the plough, buffalo enjoying a mud bath and women making palm sugar via traditional methods. It felt like a truly authentic travel experience. Whilst at Banteay Srei we listened to one of the many bands dotted round the temples of Angkor. The musicians are landmine victims who have sustained various injuries. We sat in the shade, enjoying a couple of tunes played on traditional Cambodian instruments and gave them a few Riel for the trouble. If you are visiting Siem Reap – as most travellers to Cambodia will – it is well worth taking the time to see a less well-known Angkor temple. You won’t be disappointed. Only by escaping the crowds and getting off the beaten track will you be able to truly imagine what these temples were like in their prime, hundreds of years ago, full of majesty and mystique. Posted in Cambodia, MenuTagged angkor, bantaey srei, beng mealea, cambodia, rtw, siem reap, southeast asia, temples, travel, tuk tuk. hi helen,maybe you should think about a career writing travel books?